It is no secret that the overuse of antibiotics in animal feed is of great concern. While regulations for meat and milk withdrawal times do a reasonable job at keeping antibiotics out of the food supply, large populations of livestock receiving subtherapeutic amounts of antibiotics over long periods of time has contributed to the development of drug-resistant bacteria. Life, as Dr. Ian Malcolm tells us in the movie Jurassic Park. Bacteria are no exception. If you’ve read the first two entries in this week’s series, you may recall that leaving my property better than I found it is something of a theme right alongside sustainable agriculture. The same goes for the gene pool of the livestock I keep. Standard farming methods require the use of dewormers, supplements, antibiotics — whether synthetic or natural, animal owners use a whole host of interventions designed to keep animals healthy. I am not averse to treating acute illness or parasite infestation in my animals, but with every use of every intervention, we run the risk of that intervention no longer working. This is true both of synthetic medications made in a lab and herbal treatments: they all use chemicals toxic to bacteria or parasites in order to kill the problem organism. Unfortunately this can cause an unskillfully treated flock or herd to become a tiny evolution lab as pathogens and parasites find a way to thrive, becoming resistant. What does all of this mean for sustainability? For me it means selecting hardy breeds and/or only breeding animals who thrive without these interventions. I’m not concerned with whether or not an animal has a parasite load, for instance. Any animal living and foraging outdoors is going to have one. What concerns me is whether or not an animal needs constant intervention to moderate her parasite load to a level she can handle. If so, these aren’t genes I want to add to my program, and the animal in question will be sold or culled. Our chickens and guineas, living free range, are the most ruthlessly culled, but not by us. Birds that don’t thrive usually get picked off by predators before we even notice there’s a problem. The result is a core flock that is hardy, wily, and excellent parents. They aren’t purebred anything, making their offspring not particularly marketable in today’s pet chicken economy, but they are birds that my ancestors would have recognized as good livestock — unlike the purebred flocks that have lived confined and medicated and coddled for so long that they’ve forgotten how to even sit a clutch of eggs. The goats are a slower game, since it takes so much longer to raise a new generation. Here I crossed in Baylis line Spanish, renowned for their hardiness and good hooves, to improve my beloved but relatively fragile dairy goats. Being a large investment per animal and living confined, it’s much easier for me to spot signs of acute illness and parasite infestation and act on them, but if it’s happening too often then an animal must move on. There’s a small market for my outcrosses, since there are still people who value hardiness and low-input care in goats over pedigree. Certainly it’s easier to sell the babies than it is with the chickens! The Soay ewes invite you to admire their phenotype and cherish their genotype. Lastly, the Soay sheep offer their own conundrum as I learn to shift to conservation breeding. 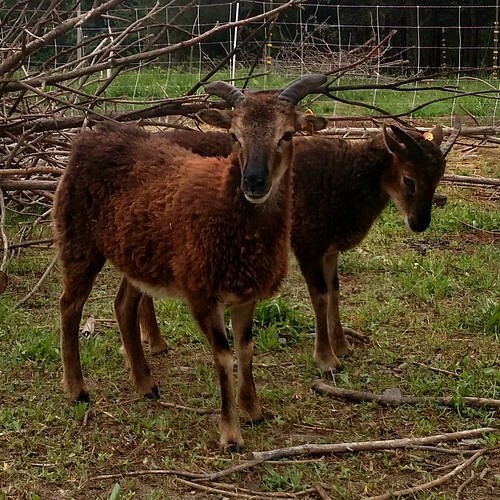 To remove a Soay ewe from the gene pool is a monumental act, although not so much for a ram provided he has plenty of brothers. Each kid is precious to the small Soay genetic legacy but the ewes, who can only produce one or two offspring per year, are most precious of all. Here, the best way to maintain hardiness is to try like hell to avoid inbreeding depression while at the same time matching the most disease and parasite resistant rams with ewes whose bloodlines need a little boost in that area. The maintenance of animals who can establish a detente in the arms race with parasites and pathogens on their own means that when I really need a medical intervention for one, it will work. It means that when I sell an animal, the new owner isn’t also getting a load of well-evolved parasites that laugh at the thought of fenbendazole. And it means that I’m not constantly rounding animals up to give them shots of antibiotics, drenches of dewormer, or other unpleasantness for the animal. Sustainability isn’t the fast game of this year’s show season, milk test, crop of lambs. And hilariously, in this case, it means not only selecting for and protecting livestock gene pools, but conserving the gene pools of parasites and bacteria as well, to maintain populations susceptible to medical intervention for as long as I can. I am LOVING this series! Really interesting stuff, and I’m glad to know there are still farms like yours out there.